Buddhism is recognized as the fourth religion of the state. France has over 200 Buddhist meditation centers. It mainly consists of Chinese and Vietnamese immigrants, but has also managed to attract a large number of converts. Alexandra David-Néel was an important early French Buddhist. 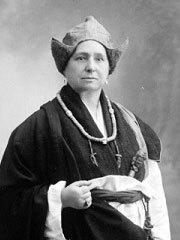 She is most known for her visit to the forbidden (to foreigners) city of Lhasa, capital of Tibet (1924) and wrote more than 30 books, about Buddhism, philosophy, and her travels. In 1911 Alexandra traveled for the second time to India, to further her study of Buddhism. She was invited to the royal monastery of Sikkim, where she met Maharaj Kumar (crown prince) Sidkeon Tulku. She became Sidkeong’s «confidante and spiritual sister» (according to Ruth Middleton), perhaps his lover (Foster & Foster). She also met the thirteenth Dalai Lama twice in 1912, and had the opportunity to ask him many questions about Buddhism—a feat unprecedented for a European woman at that time. Taisen Deshimaru was a Japanese Zen Buddhist who founded some dojos in France. Thich Nhat Hanh, a Nobel Peace Prize-winning, Vietnamese-born Zen Buddhist who was influential in the Engaged Buddhism movement in France, with followers around the world.